Fig. 1. Typical ELISA output. Darker wells indicate higher levels of analyte in the original sample. The basic enzyme-linked immunosorbent assay (ELISA), or enzyme immunoassay (EIA), is distinguished from other antibody-based assays because separation of specific and non-specific interactions occurs via serial binding to a solid surface, usually a polystyrene multiwell plate, and because quantitative results can be achieved. The ELISA procedure results in a colored end product which correlates to the amount of analyte present in the original sample. 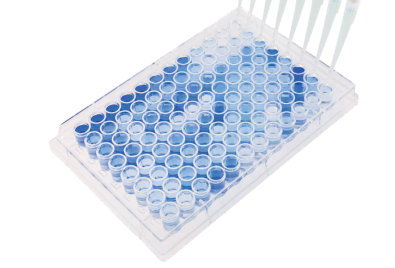 ELISAs are quick and simple to carry out, and since they are designed to rapidly handle a large number of samples in parallel, they are a very popular choice for the evaluation of various research and diagnostic targets. Figure 1 shows a typical ELISA result. ELISAs were first developed in the early 1970s as a replacement for radioimmunoassays. They remain in wide use in their original format and in expanded formats with modifications that allow for multiple analytes per well, highly sensitive readouts, and direct cell-based output. Presents a brief background on ELISA principles and an overview of the technique. Covers the available ELISA techniques and offers guidance on selecting these for different assay scenarios. Lists the key details for determining ELISA detection options. Outlines the different data models, details the main considerations for achieving optimal data and indicates the possible detection ranges for ELISA. Gives basic direction for incorporating ELISA controls. Helps to plan ELISAs with advice on plate, antibody, buffer, and substrate selection. Covers details beyond basic planning and gives hints on achieving optimal outcomes with antibody and buffer optimization. Lists protocols for the various ELISA approaches covered in this guide. Supplies useful steps for troubleshooting unexpected results. Lists the technical terms associated with ELISAs. Which ELISA is right for you?